I purchased my 95 ZJ as a daily driver and as a tow rig for my CJ-7. I have to drive roughly 240 km (110 miles??) a day. A lot of this driving is done in the dark, and since I live in the woods, there is naturally a lot of wildlife to be seen, and hit. I also didnt want to hit another deer (hit one almost one month after I bought it). I felt that the high beams on my ZJ were inadequate, so I decided to add some high powered lights. I purchased four Pro Comp 8 inch 130 watt lights. I mounted them on a roof rack that I built, which also holds my spare tire and 55-watt reverse light (which I get to later). There are a few ways of doing this (schematic 1). Using an off-the-shelf relay, fused power (connect a fuse right after the battery) is connected to terminal #30. Connect one wire from your lights to terminal #87 and the other to ground (preferably directly to the battery). Terminal #85 also gets connected to ground. Then, terminal #86 goes to your ON/OFF switch. Llastly, connect the switch to any 12 volt source and you're finished. Flip the switch and you lights should go on. 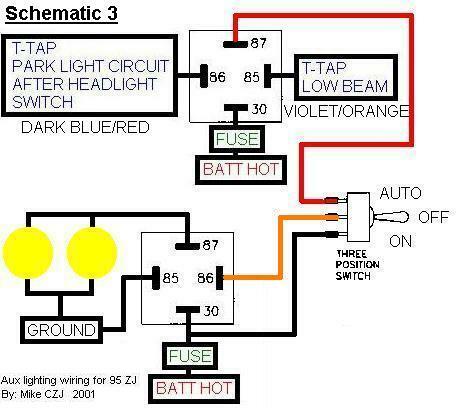 Another way, with just one more wire, and the way I wired up th auxillary lights on my CJ-7, is the same way as above, but instead of using a standard ON/OFF switch, use a ON/OF/ON switch (schematic 2). The extra connection on the switch goes to your high beams. When the switch is in the proper position, the lights will come on when you turn your high beams on. One less switch to worry about and you won't blind anyone looking for a whole bunch of switches. Unfortunately, the above way does not work on my ZJ. This is due to the fact that Canadian Jeeps have day-time running lights (DRL) which amounts to the high beams running at a decreased voltage. 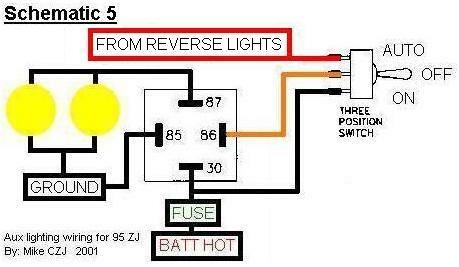 Using the above schematic would activate the relay and the lights, and that would not be good. So, after some research, and help from Alan Ratcliffe, a schematic was drawn (schematic 3). In order to bypass the DRL, another relay had to be use to arm the system. Terminal #30 is still connected to fused power. Terminal #87 (the relay's output) is connected to the ON/OFF/ON switch. Now here's where it gets a little complicated. Terminal #85 is t-tap'd to the low beams. 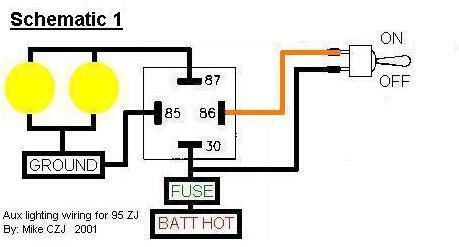 On the ZJ, it is the violet wire with an orange tracer. Terminal #86 is t-tap'd to the parking light circuit after the headlight switch. It is the dark blue wire with a red tracer. Both of these wires are located under the dash on the driver's side. 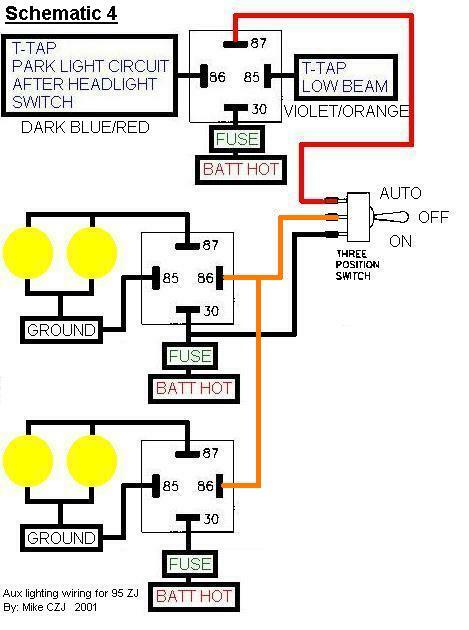 How this arming circuit works is, when your low beams are on, the parking light circuit is also on, and the low beams are on too. So Terminal #86 and #85 are both at 12 volts. 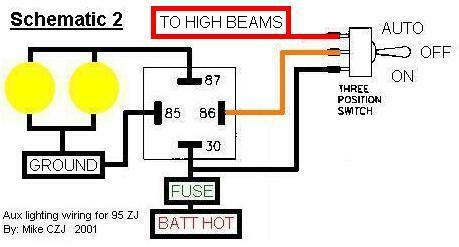 When you turn on your high beams, the low beams turn off, the circuit is complete and the relay is activated. Power then flows through your ON/OFF/ON switch to the next relay, activates it and your lights come on. When using my lights, I wanted the two center lights and the two outer lights to be on separate circuits so I can use smaller gauge (numerically higher) wire. So now I had to add another circuit. 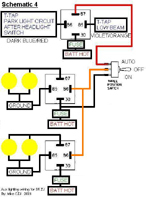 (schematic 4). The only difference is that there are two circuits connected to the arming relay. Mounting the switches, relays and how I routed the wires. If you remove the box in the center console, there is a metal box inside (I think it's the air bag control box). It has a tab on it with a threaded hole in it. I got a small piece of steel and mounted the relays on it. The switches were mounted on the automatic shifter cover on the center console. It actually looks like it come from the factory that way. Routing the wiring took me a long time. The wiring from under the dash to the relays was routed under the dash and through the center console. The wiring from the relays to the roof was a little tougher. I ran the wires under the carpet to the drivers side rear corner, the wire were then feed through the little vent in the pillar, and out to the roof rails and to the lights. Sound easy but it took a long time to get the wire through that stupid little vent!! As mention earlier, my reverse lights. Having tinted windows and trying t back up at night with those crappy reverse lights isn't easy. So I purchased a set of 55-watt driving/fog lights. I mounted them to the roof rack. Wiring this light up is almost exactly the same as (schematic 2), the only difference is that instead of connecting to the high beams, the circuit is connected to the reverse lights(schematic 5). I wired them up so I can also turn them on when I want, so If I have to do something behind the Jeep it doesn't have to be in reverse. I have had these lights installed now for about 9 months and they work perfectly. I don't know if I explained it well, but like the saying goes, a picture is worth a thousand words. If you have any questions, feel free to ask me (mike.mueller@excite.com). Special thanks go out to Alan Ratcliffe for his help. If it wasn't for his help, I would have 4 lights that don't work!